I love this photo of John and Yoko that is from the Sotherby's auction right now. They look so casual and relaxed. I have only seen this photo in black and white---so seeing John is wearing a red shirt makes the photo look different. Love it! This photo was taken by fan Brenda Spencer, who used to hang out at the Dakota with other friends, some of which are friends of mine too. 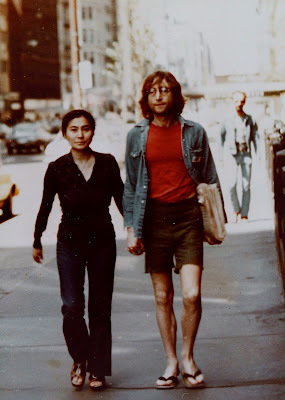 They became quite friendly with John and Yoko. I've had this photo for many years, but I never felt I should share it because I didn't know who took it. It's wonderful! I had no idea that Brenda took this photo! I have met Brenda many times over the past years and we hung out a little before a Paul concert a few years ago. I loved hearing her John stories. That makes this photo even better---someone I know took it! Thanks Lizzie.